Maddie was in a great mood today, smiling and cooing at Mike and me. I figured I’d take advantage and had a baby fashion show. 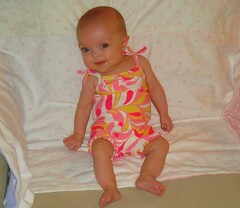 She made it through four outfits (including her first bathing suit!) before it became clear she was done having things pulled over her face. I’ve really been denying that I am sick, but I think three days of Tylenol cold, two bags of cough drops, and a box of Kleenex are telling me otherwise. I really thought I’d managed to avoid the cold that Mike and Maddie had, but alas, it is currently residing in my sinuses. I am taking the cold medicine every four hours, along with vitamins, cough drops, and various other concoctions. I feel pretty good, though it’s always the worst at night. Which is now. Bleh. I had to go to work for a few hours this evening, so I took Maddie with me. She met some of my peeps, saw my office, and promptly fell asleep. We went for a walk around the building and she wasn’t impressed, sleeping the whole time. It was LOUD, too, but nothing phased her. It’s nice to know I can bring her to sporting events, etc, and she won’t be upset by her surroundings. She’s got a lot of sports in her future. Awwwww! What a little cutie!!! We are a sports family. Both my husband and daughter play ice hockey. All 4 of my kids have been to various youth and men’s league hockey games. I took my oldest to a hockey game at 10 days old. My oldest plays every sport we can get her in to. And we take the other kids with us. My son is already telling us that “when I’m 4, I get to play hockey like Megan too”. It’s awesome when you can take them and they’re content. The twins, at 15 months, just want to run around and being strapped in a stroller is not fun for them right now. But, they still like to go and see all the action. As a side note, I love the baby fashion show. Good golly she’s cute. And sporty too? wow. And good luck with the phlegm. I hate being phlegmy.